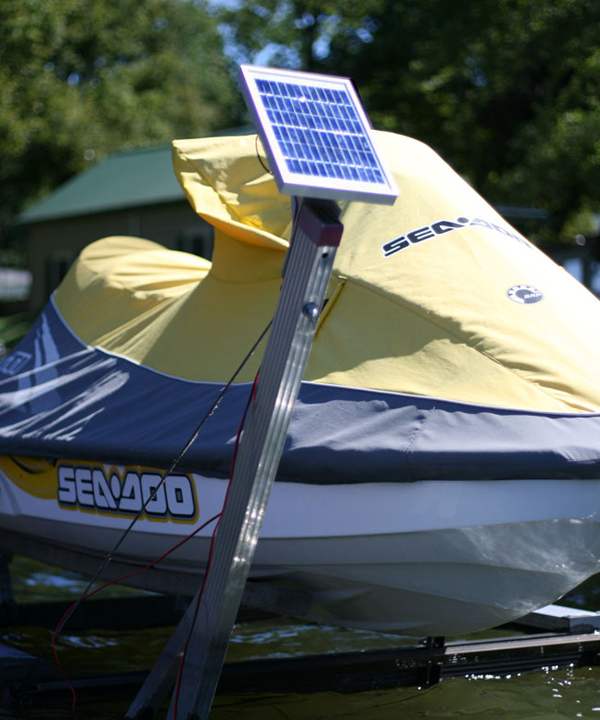 Our 5 Watt, 12 Volt Solar Marine Boat Lift Charging Kit is designed to charge light duty 12v DC boat lift systems and PWC systems that use a single 12v battery to raise and lower boats or jet skis. If you require several lifts per day and or have a heavier boat please consider our larger 10, 15, 20, 30, or 40 watt panels. 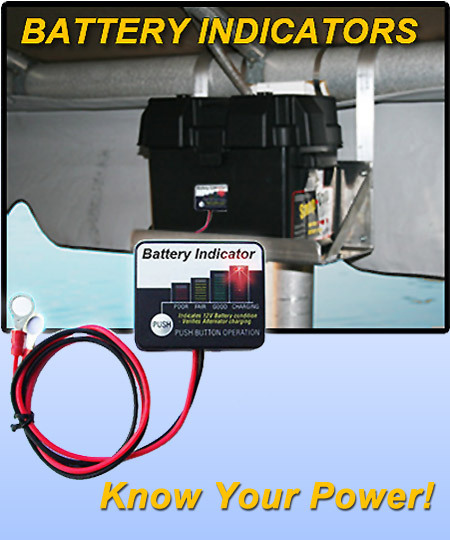 The Battery Indicator is the perfect solution to checking your boat lift battery or any 12v battery. Easily and instantly displays the condition of the battery with the push of a button. The indicator be used with all 12 volt batteries, regardless of size or type including maintenance free, deep cycle and gel type batteries. 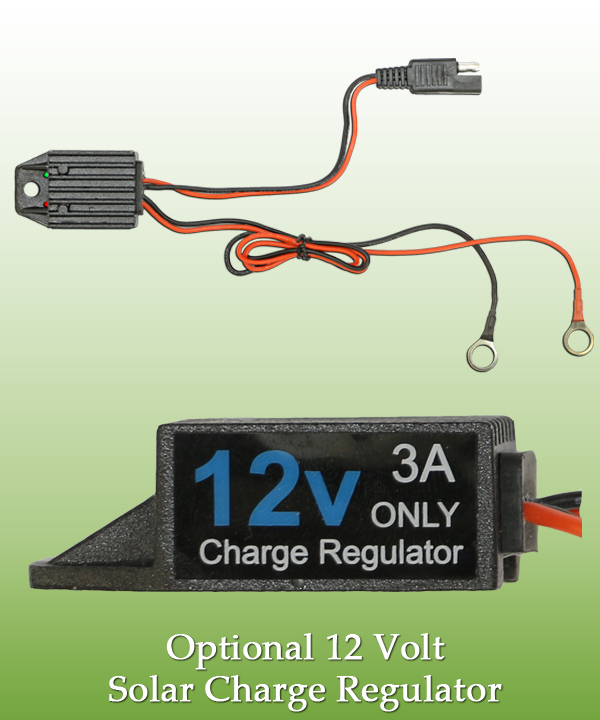 This is one of the first charge regulators designed for 12 volt battery systems that has an LED indicator and a Intelligent Battery Management System (IBMS). Far from your standard regulator, this has an advanced micro-processor with software that intelligently monitors battery conditions up to 100% as opposed to standard PWM regulators that monitor batteries at 55-60%. An LED indicator shows the charge status, lets you know the regulator is working and the charging state (SOC) of the battery. Rugged aluminum housing and epoxy encapsulated electronics make this unit is both durable and water proof. Comes with 2-pin connects that fit our solar panels for reliable, fast connections. Quick installation is permitted by 3/8-inch ring terminals to the battery side. 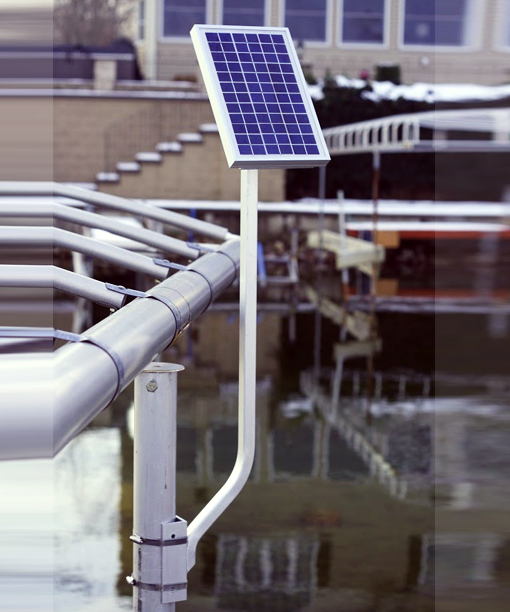 Designed to fit all band boat lifts (with or without canopies), the Single Universal Battery tray can be mounted on any type or brand of boat lift, including those with square, round or rectangular vertical posts. It's sturdy construction holds a single standard 12V battery. The tray kit includes the following components: 1 (one) Single Universal Battery Tray; 2 hanging arms; instructions and wiring diagrams; and free technical support from the manufacturer. The tray area is 9 by 15 inches in diameter. 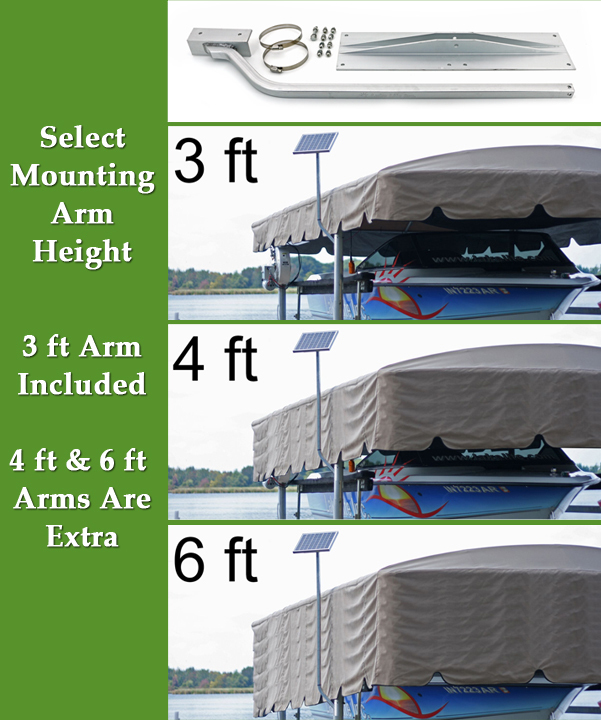 With rugged, high-strength aluminum construction, this battery tray fits all band boat lifts with canopies. 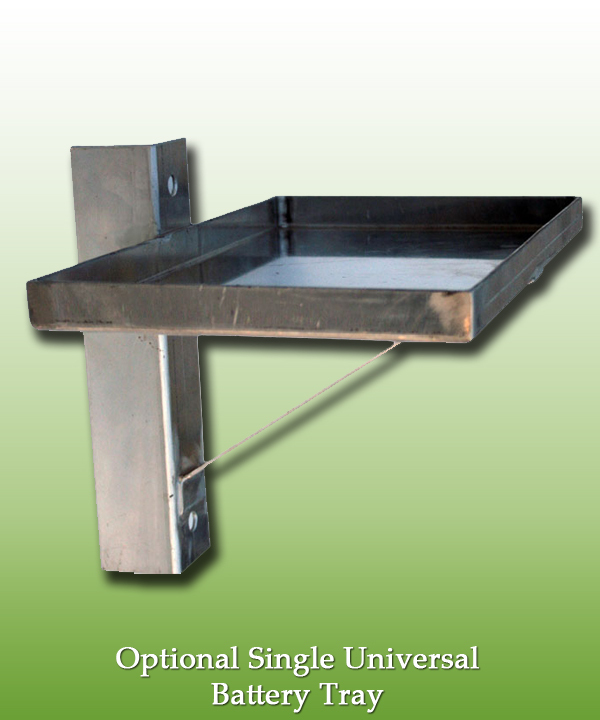 (If your lift does not have a canopy, please select our Universal Battery Tray.) 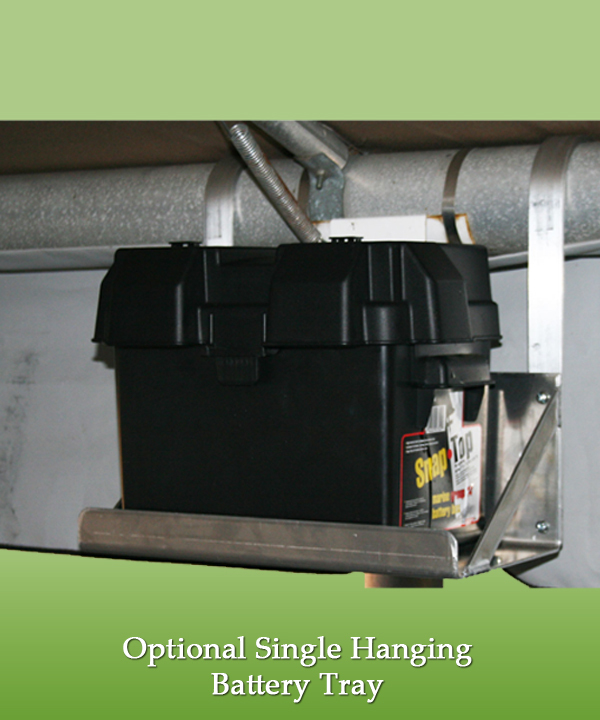 Designed to hold one standard 12 volt battery, it can be suspended from round, square or rectangular horizontal canopy poles. 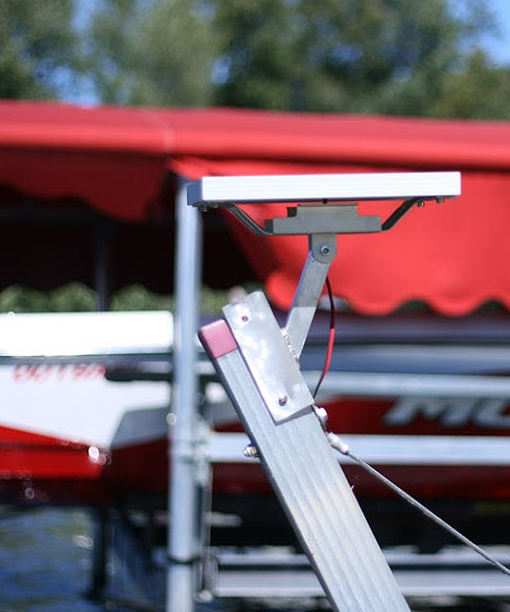 The tray hangs against the vertical boat lift pole with a spacer to make mounting it level a breeze, and keeping the battery higher than our Universal Tray and out of the way. The kit includes: one (1) single hanging battery tray, with a 9-inch by 14-inch tray area; wiring diagrams and instructions; and free technical support. The position of the tray is adjustable, and the system has a sharp 2-inch by 2-inch vertical mounting extrusions.